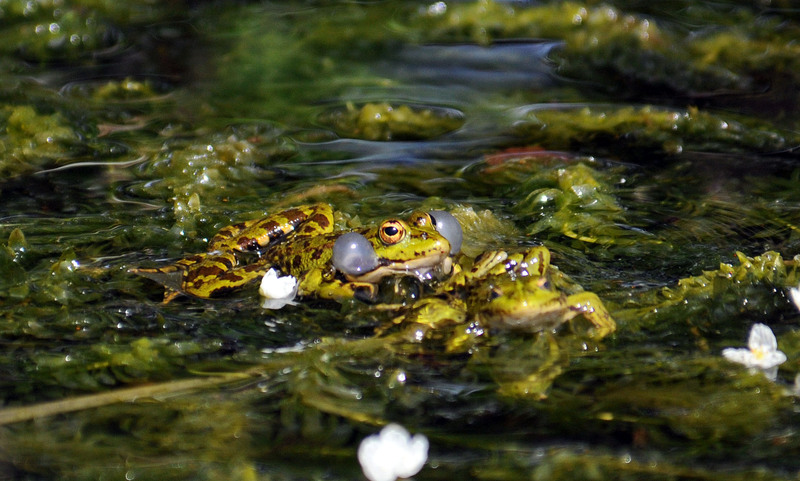 Whilst I was waiting for a flight back to London at the small airport at La Coruna, in northwest Spain, I went for a walk outside the terminal building and found a pond full of mating frogs! 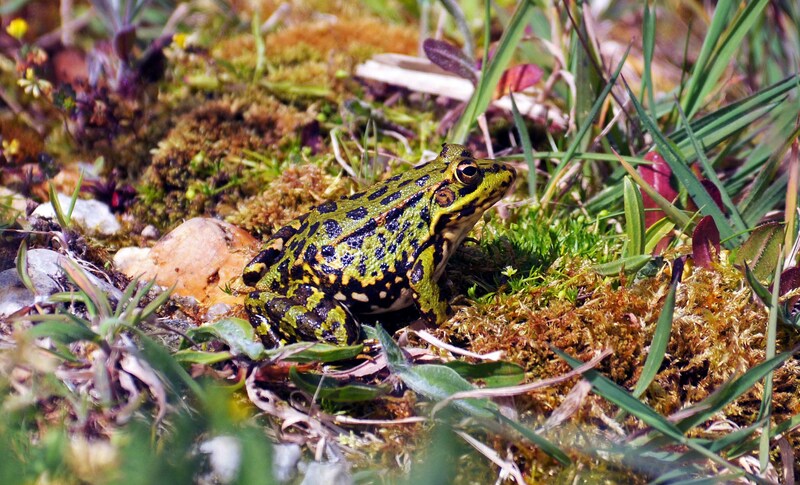 It was a nice way to spend the time waiting for my flight and I was able to watch and photograph the frogs in the Spring sunshine. 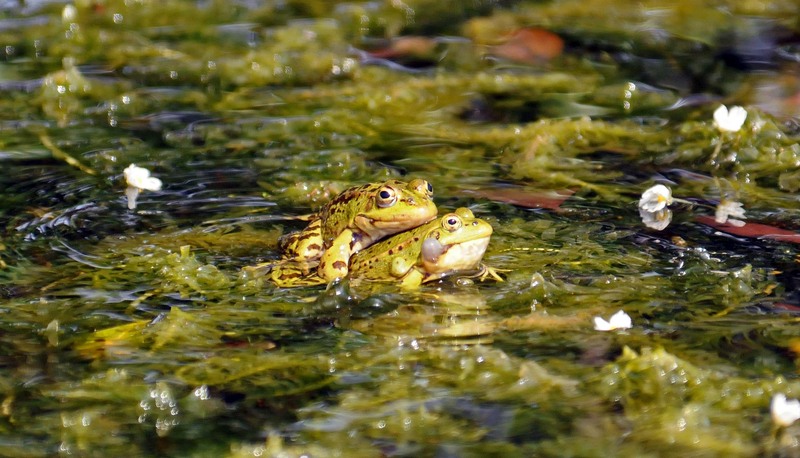 Spring was certainly in the air for these frogs, which are Perez’s frog, also known as Iberian waterfrog, Iberian green frog, or Coruna frog (Pelophylax perezi) (1) and they were croaking away and hurling themselves at each other with abandon! 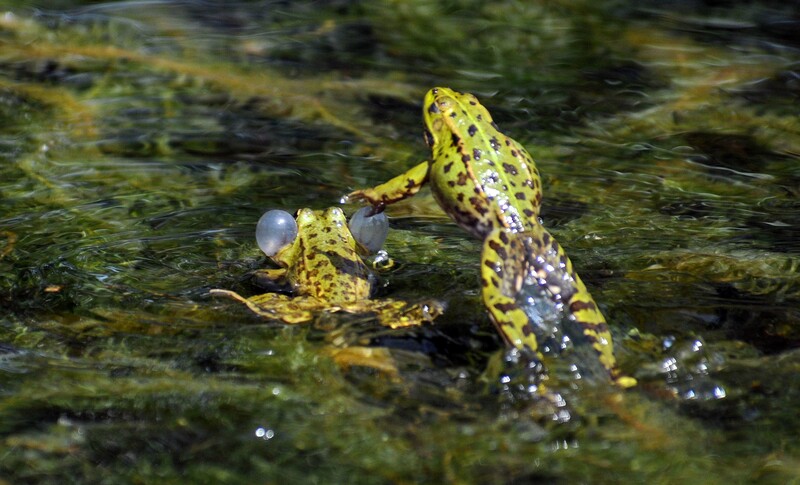 This was presumably their mating ritual, although most of the leaps ended in one frog colliding into another, or missing it completely as the other frog swiftly moved out of the way! Perhaps they were just frisky! 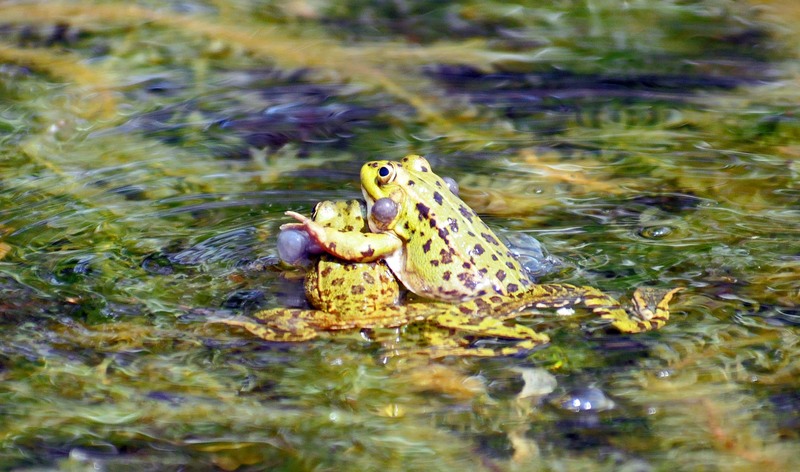 I am not sure if any of them were actually mating, they mostly seemed to be leaping about and croaking. Perhaps this was party time! I think what was happening was that this pool contained a high density of males all calling and tussling with each other to try to attract a female to come and mate with them. 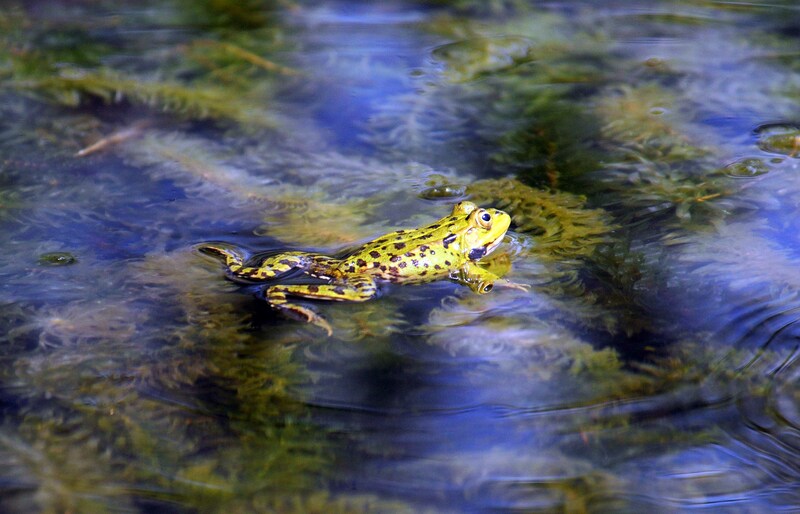 There were quite a few frogs basking in the sunshine around the edge of the pond; or at least they were until I approached, and they leapt into the safety of the water with a satisfying plop! Perhaps these were the admiring females? Although this one looks fairly nonplussed! Some individuals seemed a lot more relaxed than others, perhaps they were just having a break from the proceedings, and floated serenely on the surface of the pond. This species is found in southern France and across the whole of the Iberian Peninsula. It has been introduced to the Balearic Islands, and the Canary Islands (Spain), as well as two sites in the United Kingdom (Kent and Surrey) (2). One of the most striking features of this frog are they two inflatable vocal sacs either side of the head. These little greyish balloons are inflated very rapidly and can be sucked back in very quickly as well. For photographers, I took these images at a shutter speed of 1/1000th second which unfortunately, was not fast enough for some of the shots. 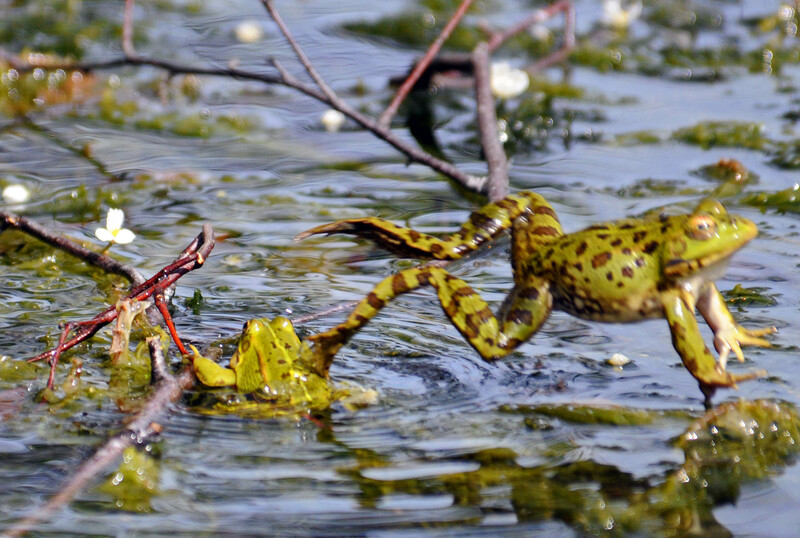 A speed of at least 1/2000th second would probably be needed to ‘freeze’ the leaping frogs. Next Next post: Lovely little daisies! I got the identification of this frog wrong when I first posted this particular blog post. Apologies to readers (and to the frogs!) and thank you Miguel who pointed it out. It has taken me a while to make the changes. 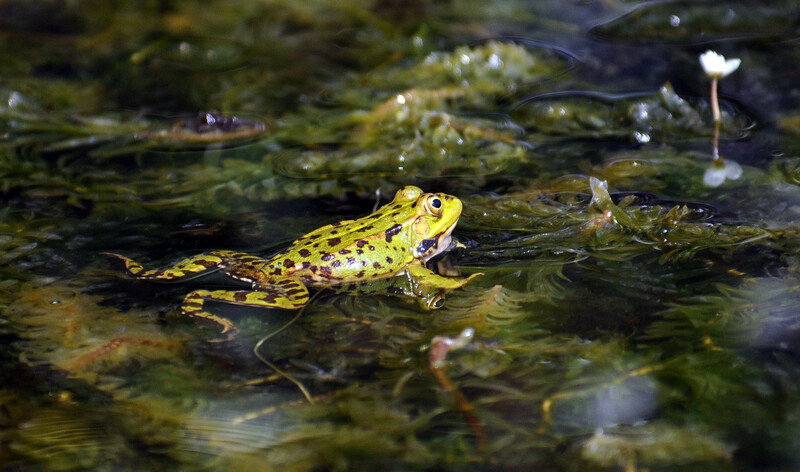 I have been back to see these frogs again at the airport at La Coruna and may follow up with some more photographs. Thanks for the link to this post left on my ‘Spanish’ blog. I enjoyed your froggy story and the illustrations as well as the ID info. It really comes across that you enjoyed the few minutes of entertainment!